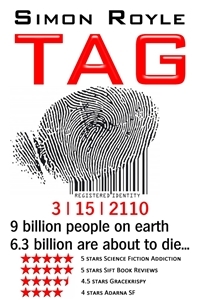 A number of people have reviewed Simon Royle’s TAG, A Technothriller. It’s a sci-fi thriller with some fun political intrigue. I appear to be in middling ground regarding the quality of writing in Mr. Royle’s book. As others have noted before, the premise, the world and the events created are very compelling. So the question becomes – is this book more than a great idea or is it a well-written story the weaves in a clever idea. His story is written with more than reasonable skill: It is populated with clearly-defined characters and a solid well-paced narrative. Were the characters complex? No. Did the dialog and story line progress in a crisp and exciting manner leading to a fulfilling crescendo? No. There were times the characters were a bit wooden and the ending was definitely deflating. However, this novel was not a poorly executed good idea. It was a reasonably executed great idea (I could have lived without the whole gay/transgender thing). I anticipate that Mr. Royle will continue to hone his craft and I look forward to reading his Bangkok Burn.